LOT Polish Airlines – flying the new Boeing 737 MAX-8! LOT Polish Airlines today welcomed the latest addition to its fleet, the Boeing 737 MAX-8, which landed this morning at London Heathrow Airport. Aircraft SPLVA is the first of 6 MAX-8’s on order and will initially operate the London-Warsaw route twice per day with the B737 NG operating the third flight. Offering greater capacity and enhanced comfort the cabin interior has been styled on our long haul 787 Dreamliner product, with larger overhead lockers improving the on board experience. 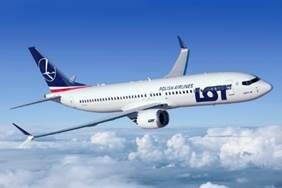 LOT is the only airline to offer a 3-cabin service between London and Warsaw with 20 flights a week. Operating the first and last flights to and from both destinations LOT is the best at offering wider choice to both corporate and leisure travellers. https://gtm.uk.com/wp-content/uploads/2017/12/Lot-737-Max-8.jpg 188 282 Paul https://gtm.uk.com/wp-content/uploads/2015/05/logo_trans.png Paul2017-12-04 16:38:292017-12-04 16:38:29LOT Polish Airlines - flying the new Boeing 737 MAX-8!